Once a week I post interviews with interesting designers about their insights on their experience of working in the Knitting industry. I’ve noticed that every designer makes their living in a slightly different manner bringing their own unique presence to the Knitting world. Alasdair has a new book out available from Cooperative press. 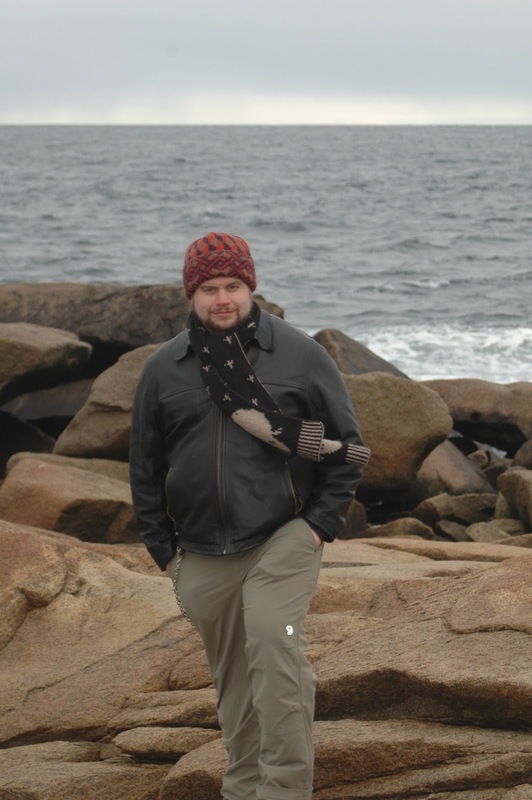 He is a lifelong crafter who lives in Cambridge, MA, with his wife and cat. When he’s not knitting, he enjoys cooking, fixes computers for Brandeis University, listens to esoteric music, audiobooks, and NPR, and tries to spend as much time outdoors as possible. You can find Alasdair here, here and here. He is on Ravelry here. You've been working on innovations with double knitting techniques. Could you tell us about how you came to focus on double knitting? I've always been fascinated with the efficient use of space. I can't say my everyday life is an illustration of that, but it always makes me feel good when I find a better way to organize things. My online handle "fallingblox" predates my knitting life, coming from my obsession with Tetris-like games from an early age. I guess when I taught myself to knit, I was disappointed with the wasted space on the "wrong side". Most knitting is not meant to be framed on a wall; it's three-dimensional and I feel like both sides should be attractive. When I began designing knitted objects, I started with Moebius scarves in reversible knit and purl patterns. It's only natural that when I decided to add another color, I found double-knitting to be the most fitting technique. The irony is that, to this day, I have yet to design a double-knitted Moebius scarf. How did you develop your new charting method? I assume you're referring to my two-pattern notation, which allows you to chart both sides of a double-knit fabric in different patterns. It was really just a matter of thinking logically about what I was doing, then laying out the two sides and interlacing them. At the same time I worked out two-pattern double-knitting, a small meme must have been released because two or three other people elsewhere in the world simultaneously worked it out and found their own ways of notating two-pattern charts. However, while others decided to try to squeeze both colors into a single chart element, I took a more literal approach. If you read across a row of one of my two-pattern charts and compare it to the finished row on your needles, you'll find that the colors and stitch types correspond exactly to the pattern -- like any other knitting chart. Essentially what I've done with these charts is to show you literally what you're doing using familiar notation. Because of this, I've heard reports of people with no double-knitting experience successfully knitting one of my two-pattern charts. The other strength of my notation method is that it frees you to design in any number of colors without changing your notation style -- although there are practical limits to how many colors you can double-knit with. Utica. Hah! That's what Gary Larson used to tell people when they asked where he got the ideas for his Far Side comics. To be honest, I think there's just something a little unusual about my brain. I find beauty in the oddest places, and I wish I could tell you where the ideas for my work come from. I love geometric interactions and the interplay of colors, and I find those things anywhere I look -- even when I'm not looking. But lately, the techniques have come before the designs. I'll think of a technique and work out a design that fits it well. In the process of adapting the technique to double-knitting, the design may change several times from the original concept. I've had this issue for a long time. Yes, I'm afraid of being influenced too much by others' work, but in this day and age we can't help it. If you don't look at other people's work, you won't know what's in fashion, and you also won't know what's already been done. If you do look at other people's work, you may never start for fear of being accused of copying someone else's idea. Now I don't care so much about fashion -- I'd like to think most of my designs are outside that limitation. Also, if you start a large double-knit project for something that's fashionable now, it might be out of style by the time you finish it. Hats, scarves, mittens, neckties, baby booties, blankets, etc -- these things don't go out of style, or not as quickly. They're also much easier to finish in a reasonable amount of time. To return to the question, I don't think it's possible to look at everything everyone else is designing and still have time to design yourself. So I don't avert my eyes from the work that people are doing in my knitting groups, or what people are wearing at fiber festivals and similar gatherings, and I stumble across stuff online and on Ravelry, but I don't make a point of researching trends or studying other people's work. It depends on the project. For my recent book, it was about half and half -- patterns I knew worked I would send to sample knitters; patterns still in development I would work out myself, then come back to them and check them over, possibly knitting them again. For my first independently-sold pattern, the Falling Blocks hat, I drew from the pool of over 2000 double-knitters in my Ravelry double-knitting group and selected 10 likely folks with varying levels of experience to test the pattern. Many of my patterns are proof-of-concept pieces -- they're designed only to show that something is possible to do -- so I'll be the one knitting the sample. If I have doubt about my notation, I may send it on to further test knitters. Not really -- I've been flying by the seat of my pants for the entirety of the book writing period. I've just tried to keep one eye on the goal and one eye on the next several steps so as not to get overwhelmed. It didn't always work, but everything fell together rather than apart in the end. The patterns I'm working on now will go up for sale on Ravelry as a test of how my rising name recognition affects sales of patterns. I may never reach Stephen West levels, but I never expected to. In the sense of someone who has nurtured my growth as a knitter from early in my career and who I look up to as a student at the feet of a master? Not really. I'm a self-taught knitter and something of a loner in general. But I think the person who fits most comfortably into that space would be Cat Bordhi. Sure, she's a mentor to many, especially aspiring self-publishing authors, but I feel I would not have come as far as I did as quickly without her help at the Men's Visionary Retreat. I probably wouldn't have even had a business without the Internet. The Internet allowed me to connect with other people who were doing double-knitting, and without them it would have taken me much longer to realize that the stuff I was doing was actually innovative and hadn't been documented before. I wouldn't have known that people liked my patterns and wanted to knit them too, and I wouldn't have had an easy distribution method. At the same time, the Internet is a big risk for anyone doing business in digital-format books or patterns, since the difficulty in securing them is often more trouble than most want to go to, and there's a large network of piracy out there. But it's a risk you take. I think knitters are fundamentally decent people who would like to see the designers they admire continue their work. As I started working with Cooperative Press, yes, I had a tech editor working on my manuscript. However, I have not released enough patterns outside of the book to require the regular services of a tech editor. I do all my own charts and most of my work is either not sized or sized very simply -- or would require a very specialized tech editor. I have some patterns in the future that will definitely require tech editing, so it's about time I find someone with that specialized skill set. Poorly, my wife would probably say. To be fair, it's not just life and work -- knitting is still not my primary job, so I have to balance my day job, my knitting work, my social life, and my marriage. It hasn't been easy over the past 2 years. I didn't have a good road map for the things I'd need to do for the book, and it seemed deadlines would creep up and pounce at inopportune times, as they do, and I'd have to drop everything and, say, print off my book and proofread it, or knock out a new website, or iron out travel details, etc. The saving grace has been that my wife works 12-8 and I work 9-5, so I have some evenings where I can work without distraction for a few hours without causing offense. My social life has really gone from sparse at best to barely existent, except for knitting-related activities. I expect this will change as I get further from my book's print date. My boss at my day job is a sometime knitter and as such is supportive of my projects, even when they require I take time off from work, as long as my work gets done. I'd like to say I take it in stride because I know everyone's taste is different and I can't please everyone, but I'm a sensitive guy and I'm sure if I start getting lots of criticism I won't take it well. However, I haven't had much yet. When my Four Winds hat first came out in Twist Collective, I had one person write a critical post about it, but when I went to read it I found he had cut down virtually every pattern in that issue. So the best I can say is, I'd take any criticism I get in context. I had the book endorsed by three knitting luminaries I admire greatly and I think it would take a great deal of criticism from random people before I decided to disbelieve the glowing compliments I've gotten from people whose opinions I value more. I'd have to check with my mother for sure, but probably around 2 years like most other people. Oh wait, did I misunderstand the question? Actually, as I mentioned before, this is still not my primary job and I'm not sure it ever will be. My patterns take me less and less time to design, but as I get into finer-gauge work, they take more and more time to knit. Even if I start using sample knitters more heavily, I may save myself some time but it will cost me more money. In addition, my work is a niche within a niche -- the majority of knitters will never try my patterns because they're into quicker knits and less into technical challenges. If I ever manage to support myself, it will be like Kaffe Fassett, where I design countless beautiful things and barely ever knit them myself. That doesn't sound fulfilling to me. As far as I can tell from talking to others who are closer to the path of a full-time knitting career, success in this field requires an eye for the ever-changing fashion of the day and a good feel for shape, design and construction. Like any other field where your success is dependent on the opinions of others -- from graphic design to food service -- be prepared to put some of the things you might really want to design on the back burner while you design things that will actually pay the bills, so to speak. I find that the pattern of mine that most people gravitate to first is Corvus, my first double-knit pattern, simple and elegant, (and free on Ravelry). It's the sort of thing that even a non-double-knitter might say "I could do that" about. It is my hope that it will be a gateway into the more advanced and interesting patterns, but I have to be satisfied if some people knit that and never go further. I could design more elegant simple double-knitting and sell more patterns that way, but I'm happy to keep pushing the boundaries of my chosen technique and releasing patterns that may never sell more than a few hundred copies. For that reason, I am not likely to have a full-time career in knitting anytime soon. But if that's the way you want to go, I wish you the best of luck.